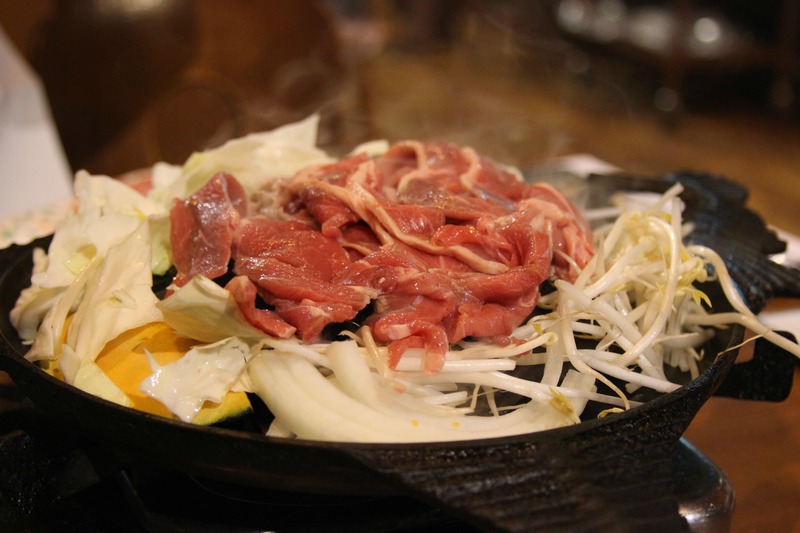 *Notes: Website (English), the specialty of the house is Genghis Khan (barbequed mutton), Viking meals are at 2720 Yen for All-You-Can-Eat and 3770 for All-You-Can-Eat-And-Drink, the closest subway station is Hiyashi-kuyakusho-mae which is on the Toho Line. Long before we ever set foot in Sapporo for the first time, I had known what I wanted our first meal there to be: Genghis Khan! This barbequed mutton dish is a local specialty and a must-have when visiting the city. And there was no need to ask the concierge for a restaurant recommendation. 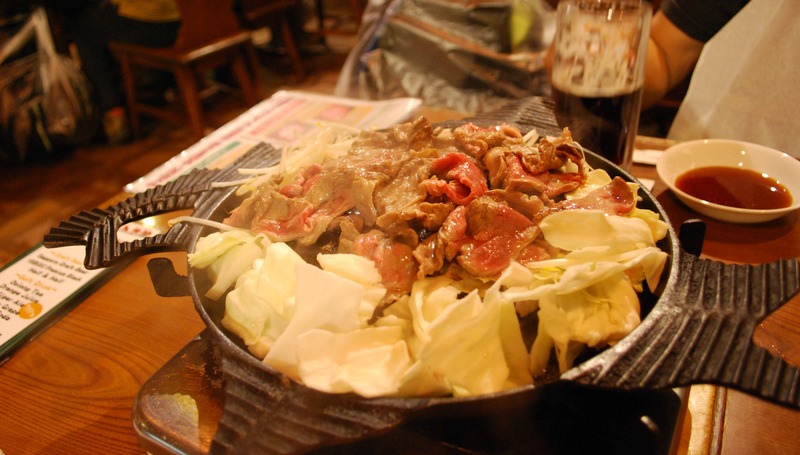 Multiple websites and blogs all said the same thing…..for great Genghis Khan, Sapporo Beer Garden is the place to go. 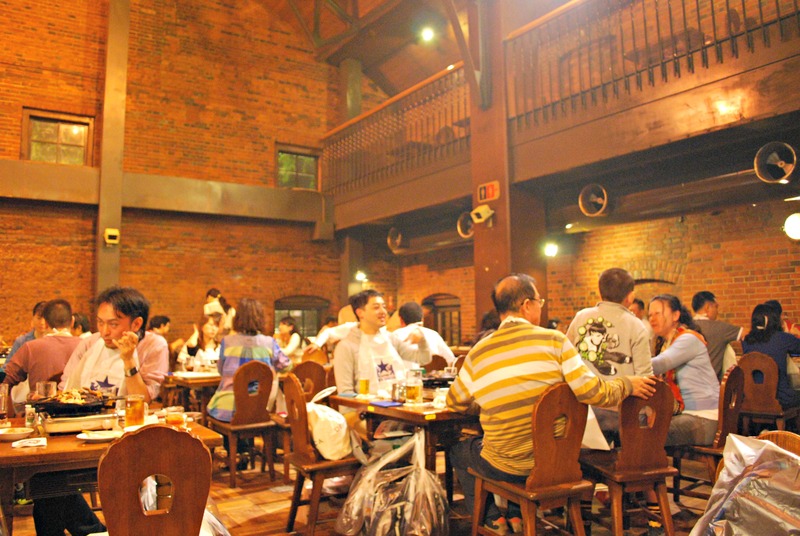 While there are a number of restaurants at Sapporo Beer Garden, we decided upon Kessel Hall which is on the second floor of the Genghis Khan Hall building. 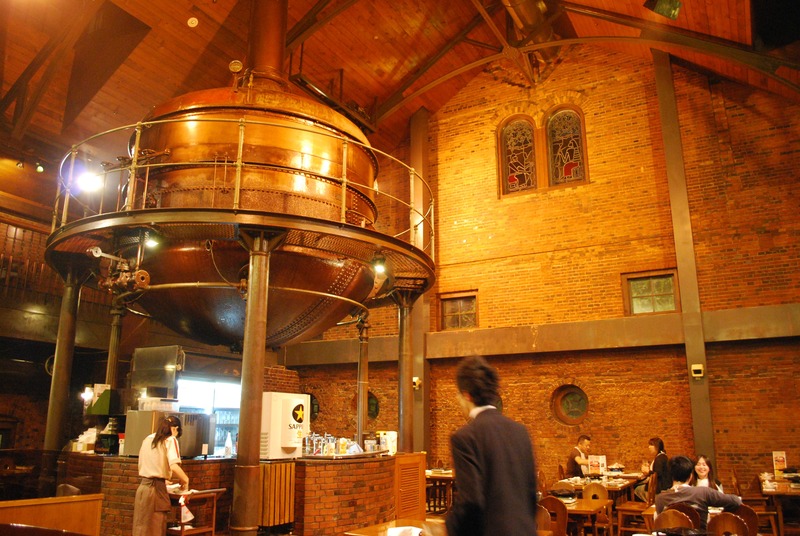 Interior shots of the restaurant made it look impressive with high ceilings, a huge dining area, and an enormous beer cauldron taking up a whole corner all by itself. The exterior of the building turned out to be equally handsome: a red brick structure covered in ivy. And the best part was the wonderful smell of cooking meat as we got closer and closer! We’d eaten nothing since breakfast in Osaka, so once we entered Genghis Khan Hall we were practically sprinting up the steps. I was thrilled when the hostess seated us close to the beer cauldron. It was very large and shiny and I wondered how many bottles worth of beer could fit into it. All the other diners looked to be having a wonderful time and I couldn’t wait to order and start stuffing my face with Genghis Khan and Sapporo Beer! The first thing our server did was to give us plastic bags to put our jackets and my purse in. This was to protect them from the mutton smoke that seemed to fill ever square inch of the restaurant. 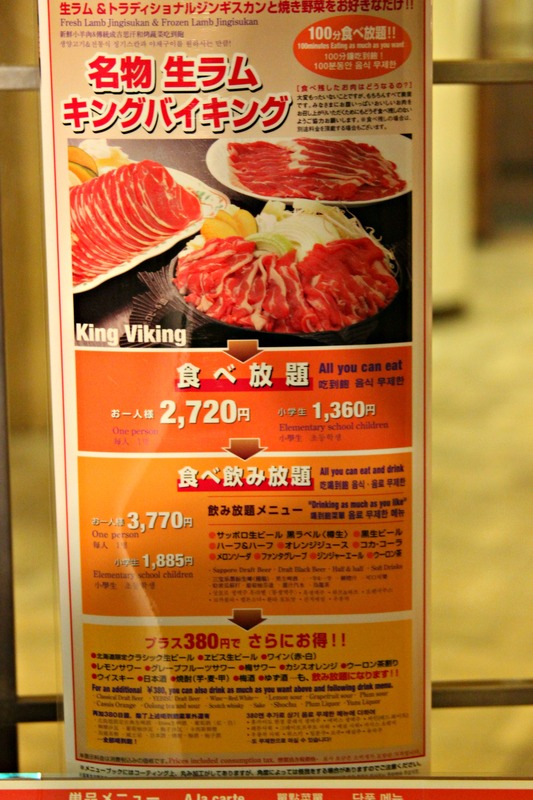 We scanned through the menu and very quickly made up our minds to both get the All-You-Can-Eat-And-Drink Viking Meal (3770 Yen each, 100 minute limit). This meal included two kinds of mutton cuts, fresh vegetables, and a small selection of drinks (some alcoholic, some not). There were a number of other items on the menu but they weren’t included in the Viking plan and we’d have to order those separately if we wanted them. Once the food arrived, we started cooking the meat and vegetables on a grill that was set up in the middle of the table. We were given a diagram showing us how to arrange the food on the grill: veggies all around the circumference and meat in the middle. 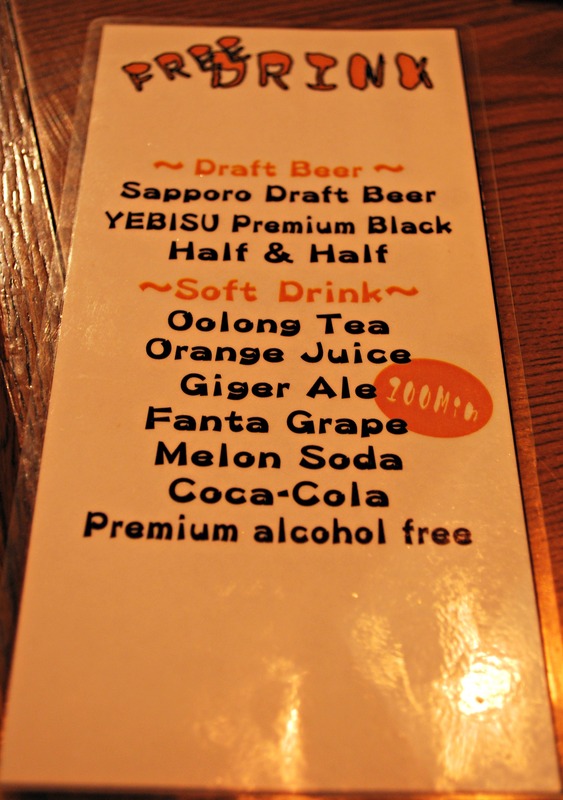 Then came our beers, Sapporo Draft for M and Yebisu Black for me. In truth, I am not that much of a beer drinker but it tasted SO good with the mutton! It didn’t take long before our faces were as red as everyone else’s in the room…..yes, the Japanese are notorious for the alcohol flush reaction. But we were having a wonderful time and somewhere along the way we lost count of how many plates of mutton and mugs of beer had been consumed. And then, before we knew it, our 100 minutes were up, and it was time to pay our bill and stumble out in to the cold Sapporo night to catch a subway back to our hotel. Very impressive architecture, looks like a German beer garden. Was Sapporo colonised by Europeans? You’re right, it really does look German, I hadn’t thought of that. 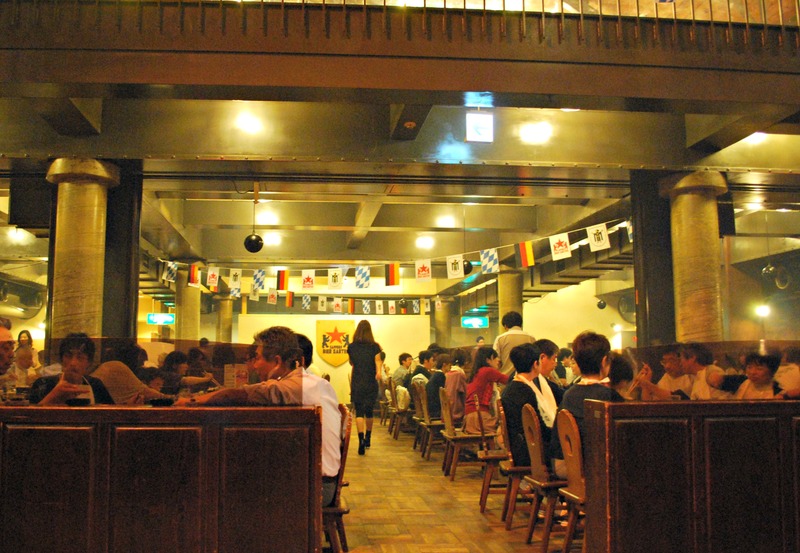 Even though Japan was never colonized, they probably really admired how the German beer halls looked. 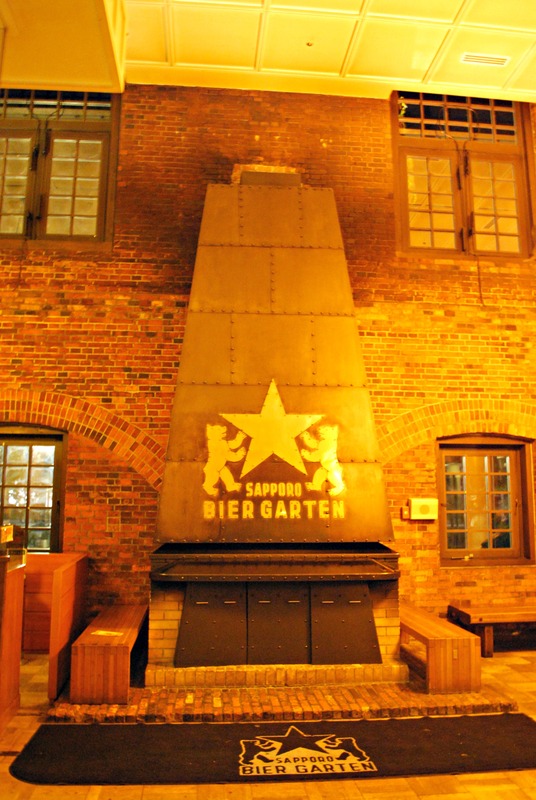 When we were traveling throughout Japan, we came upon a number of beer gardens and they all looked similar to this one in Sapporo. There was a lot of European and American influence on the development of Hokkaido in the late 1800s — the island was basically settled by Japan around the same time that America settled its western frontier. Central Sapporo is laid out in a North American-style grid system and there was a lot of Western input into the region’s agricultural industry (for example, Hokkaido dairy, corn, and of course the beer). 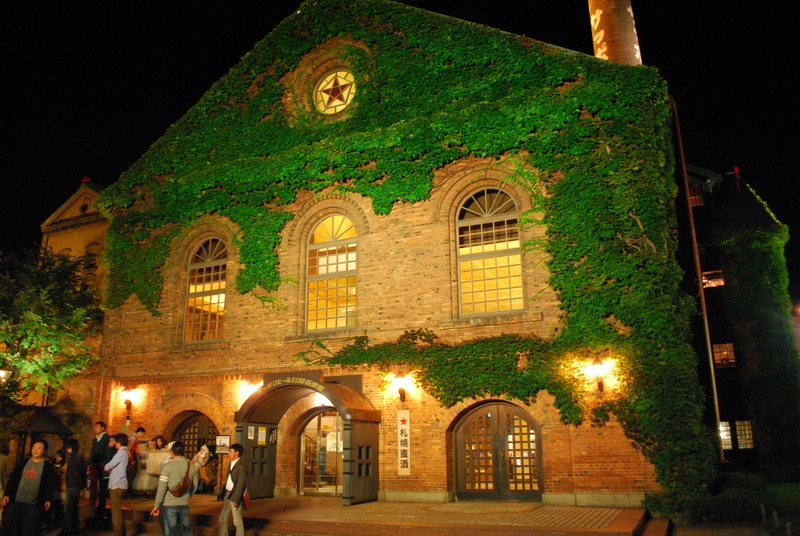 Besides the Beer Garten, you can see Western architectural influence in the old Hokkaido government building, the clock tower, and the old wooden houses in the botanical garden. I went to Hokkaido twice this year, once for the Snow Festival and then in August. I’ve been meaning to do a series of posts on it but haven’t gotten around to it. Perhaps I should so it soon so we can compare notes. Thanks so much for this informative comment, you really taught me something new! I did very much like the grid system that Sapporo is laid out in, it made it so much to get around as compared to any other Japanese city. How lucky are you that you went to the Snow Festival? I am really hoping to go someday, I just need to get adjusted to cold weather somehow. I live in Southern California where it’s pretty warm year round and I really suffer when the temperature dips into the 60s. It doesn’t matter how many layers of clothing I have on, my bones literally ache. Yes, please do some posts on Sapporo whenever you get a chance, I can’t wait to read them! Thanks so much for your comment! Hmm…Sappora Beer…perhaps the Japanese took the German beer technique and ‘Nippon-ised’ it? Just a wild thought. BTW, there’s a German-looking city in China, Qingdao which is also famous for its Tsingdao beer. No, it’s definitely not a wild thought. 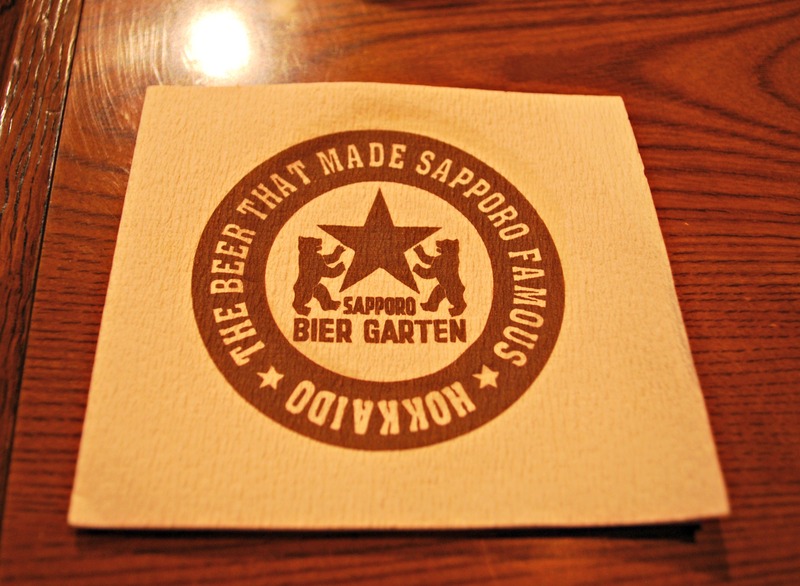 I looked it up and it appears Sapporo Beer was created by a Japanese man who had first trained in the German beer making technique. So you definitely hit the nail on the head! Just looked up pictures of Qingdao on Google. Really interesting to see all the Westernized houses scattered throughout the city. Reminds me a bit of Nagasaki in that regard. Thanks so much for the info! It was really very, very good. And, maybe it was just my imagination, but the Sapporo beer tasted much better than it does here in the States. Are there Genghis Khan restaurants in Tokyo too? Mm, thanks for the scrumptious post. 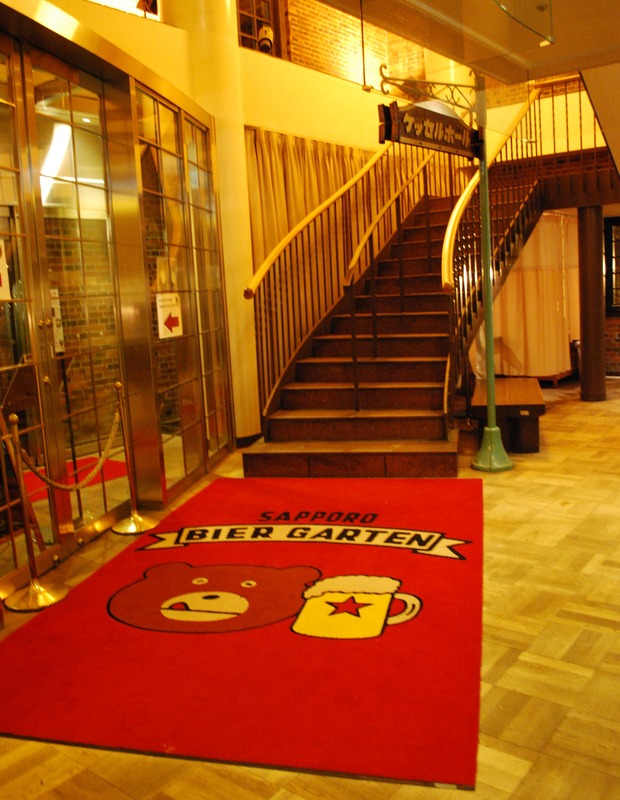 I’ll need to note this down as a potential stop on my Sapporo trip next year. Not too optimistic about landing a seat, though – with 2 million or so tourists in town for the Winter Festival, the place will probably be booked solid. Incidentally, did you notice anyone at all in the room who was dining alone? This sort of place seems best enjoyed with a group, but that’s not really an option for a solo traveller like me. I just hope I don’t get turned away at the door (assuming I’m able to reserve a table in the first place)! It’s so exciting how you will be in Sapporo during the Winter Festival! Wow, 2 million tourists, that’s crazy, I had no idea it would get that crowded. You’re going to have the best time! I would guess the Beer Garden would get really crowded during that time but if you can’t get a seat, don’t worry, there are lots of other Genghis Khan restaurants. A really popular chain is called Daruma. I think it might actually be easier for a single diner to eat there. In pictures, it appears that everyone sits at the counter. I looked through all the photos I took at the Sapporo Beer Garden to see if there were any single diners. It seems like it was mostly groups, many of them families with small children in tow. That was a little bit of a surprise since I don’t usually see too many children at US restaurants where so much alcohol is being consumed. 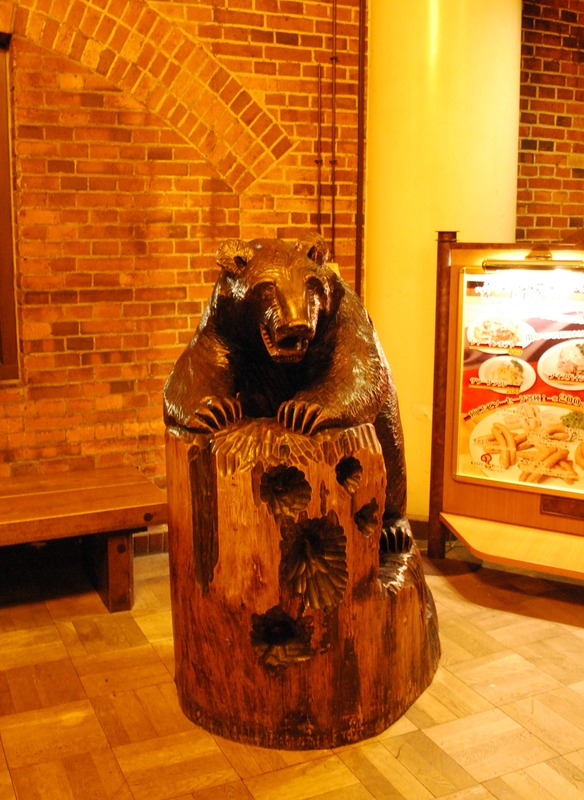 But the children seemed to be having a good time and the Sapporo Beer Factory mascot (a brown bear) bounced around greeting all of them! Actually I really wanted to try genghis khan, but I didn’t get to even though they were everywhere. Next time I definitely have to eat it! The building also looks really unique, I like how they decorate it with the ivy and the bear statue and so on. Ah, I know exactly how you feel about not getting to try the Genghis Khan. 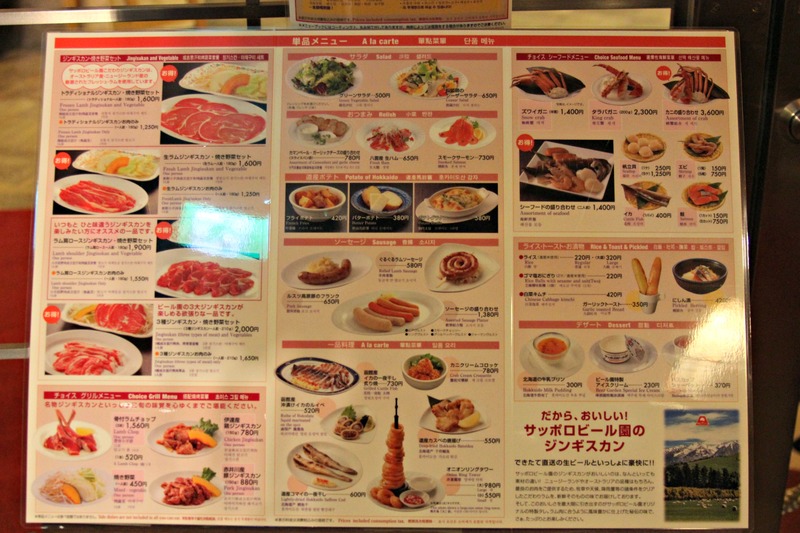 I had so many restaurants down on my Japan itinerary and I didn’t even get to go to half of them. But I’m sure you ate so many other good foods while you were in Sapporo. Did you eat any crab? I really wanted to try the famous crab restaurant, Kani Honke, in Susukino. I heard their set meals are incredible. But, unfortunately, we ran out of time. Hopefully, next time! Yes, I did eat crab~ That’s true, I think Hokkaido has so many great dishes that it’ll possibly take several trips to finish trying all of them! Japanese cuisine is undoubtedly one of the most elegant cuisines in world. Finesse and elegance just comes in when it comes to Japanese food. Thanks so much for your comment! Sorry to hear about your Japan trip, I hope you get a chance to go again someday. Yeah. I was lazy to fix my visa requirements that’s why I just booked a flight to Jeju Island. Anyway, I would really visit Japan in the near future. We want to go t Hakkaido next. You are giving me ideas! Sapporo was a great city to visit, I know you’ll have a great time when you go there. And, yes, if you like mutton then Genghis Khan is a must! But there’s so many other great regional foods: crab, soup curry, miso ramen, fresh seafood from the Morning Market….I think we were eating nonstop during our time there! Genghis Khan is another thing I have never eated either. I am a victim of my mom’s extremely fussy eating habit. 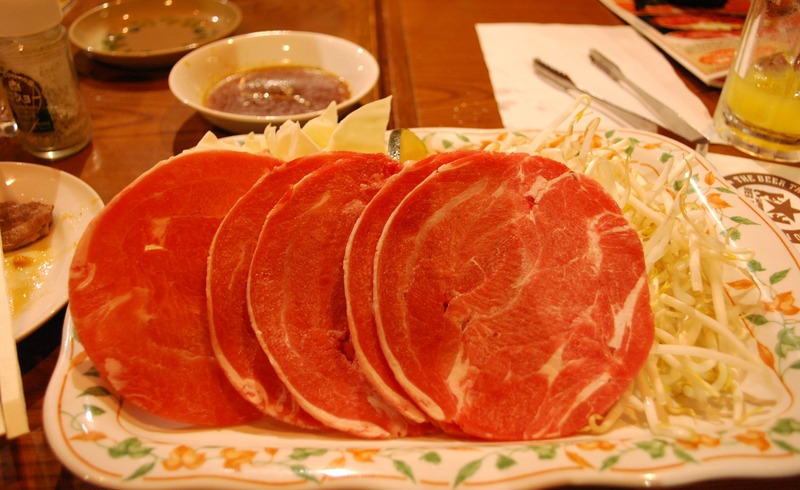 In Nagano, where she resides, there is the area well known for Genghis Khan (mutton bbq) but because she dislikes mutton or lamb, I can never sample the dish. Mmmm… next time I have to go on my own. Oh, I think you will like Sapporo very much when you go someday. I know I couldn’t go in the winter time either, I can’t STAND cold weather. But whenever I see pictures of Sapporo’s Snow Festival I always feel so sad because I really want to see it in person. I heard Nagano has the best soba in all of Japan! I really want to go there and have some zaru soba, such a simple meal but so delicious and healthy. I didn’t know that Nagano was also well known for their Genghis Khan. Ah, your mother sounds like mine. She doesn’t think much of mutton either. I think we ate lamb chops exactly once when growing up. Oddly enough, she also didn’t like pork, she said pigs are too dirty for humans to consume. So I hardly ever ate tonkatsu when I was growing up. Really weird for a Japanese person! 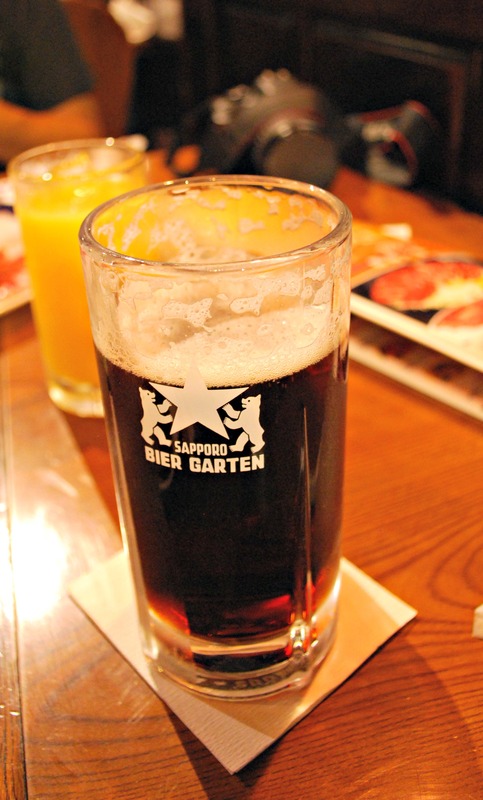 Even though I usually don’t like beers too much (I’m more of a fruity cocktail type), the beer at the Sapporo Beer Garden tasted fabulous! Especially when paired with the Genghis Khan. 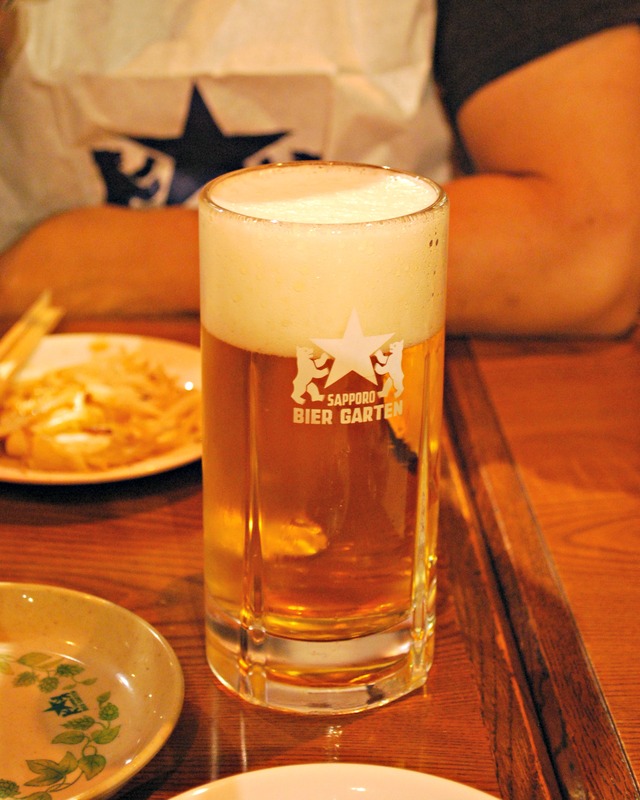 You’re so right, Japanese beer and BBQ really go hand in hand. It is a shame to have a mother with a fussy eating habit. My mom definitely robbed me opportunities to sample various delicacies. Like your mom, she is also not so keen on pork. So she chooses ebi-furai (deep fried prawn) when we eat at a tonkatsu restaurant! I don’t like British beer too much because they tend to be bitter. Don’t you find beer doesn’t taste too bitter when it is chilled very well? 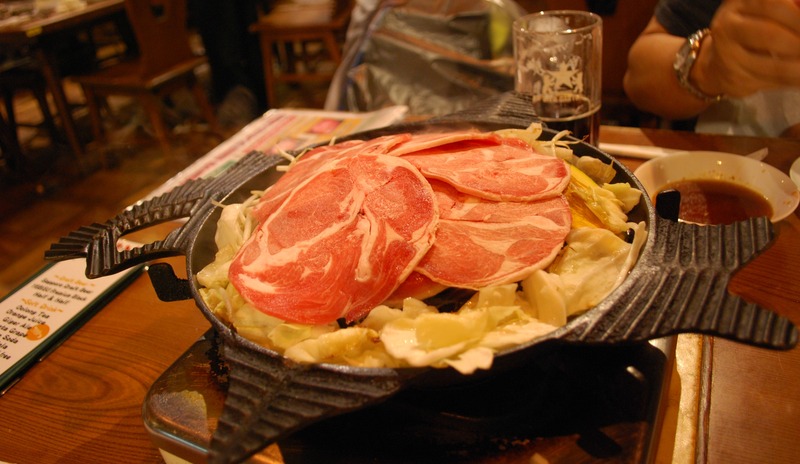 Yes, all-you-can-eat meat is always good and all-you-can-drink beer is a definite bonus! The tower at the bottom of the menu is stacked with onion rings, looks like the dipping sauces are ketchup and ranch dressing. They actually only had that one dipping sauce which was a bit of a surprise but it really did match the meat. You’re right, it looks just like soy sauce but there was some other stuff added to it. I don’t know what they’d say about a diner bringing their own sauce but if it’s a busy night I doubt they’d notice anyways. And there’s absolutely no need to apologize for all the questions, I always enjoy hearing from you guys! Looking forward to more of your dining posts! Hi ImJapan! Just nominated you for Liebster Award. Hope you accept and join in the fun! This place looks great! I imagine it does really well with both Japanese and tourists alike. Thanks so much for commenting! Yes, I think this place is quite popular with both tourists and the Japanese. Even though it seemed we were the only tourists on the night that we went, there was an English menu on hand and the server seemed very comfortable in dealing with a couple of foreigners. We went there too! I had no idea they had such good food too. Where was I looking? 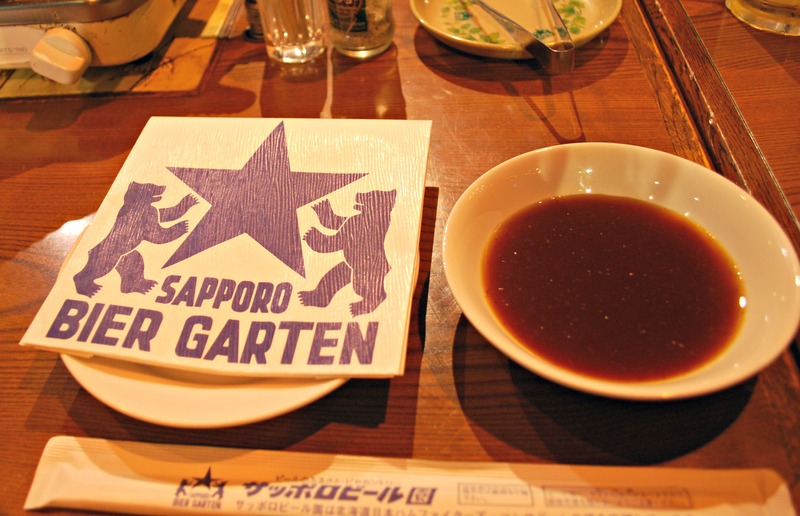 Sapporo is so full of good things to eat, it’s hard to try it all! On this last trip, I didn’t get to try their crab so I’m sad about that. I’m not much of a beer drinker so I only drank 2 mugs worth. Between that and all the Genghis Khan mutton I ate, I thought my stomach would explode. Well this place looks phenomenal! lol, freshly cooked mutton tastes so good after a long day of sightseeing! Hi-can you tell me what the name of the cooking apparatus on your table is? The little table grill? I’m not sure of the brand or name of it. I’ve seen similar ones at Japanese (and other Asian markets), but I think they were flat, not necessarily dome shaped. I must admit the dome shape was wonderful because the juices from the meat would run down to the edges and the veggies would cook in it. Sorry I couldn’t be of more help. Oh, good old Genghis Khan at Sapporo Beer!!! I remember going there with my cousin when I was a student. I can’t drink much, but I do remember that I actually thought the beer was tasty. What a lovely (and delicious) city it is. I’ve been there many times, and still keep going back there. It’s like a second home town for me. Thank you for posting these mouth-watering photos! Yes, the beer tasted really good with the Genghis Khan. I’m not usually much of beer drinker but I do tend to guzzle more of the stuff when I’m in Japan. The food just matches with it, I guess. How lucky that you can keep going back to Sapporo. I found the food there to be some of the best in all of Japan, I really hope I’ll get a chance to go back again someday.